Baptism is an outward expression of an inward change. It is the act of going public about your faith in Jesus and communicating to the world your commitment to following Him. It's also the next step after salvation. People often have questions when it comes to this subject. The Bible gives clear insight and instructions into how we should approach baptism and what it means to those who follow Jesus. He also set the example by being baptized himself. Because Jesus went public about His love for us, we can go public about our love for Him. 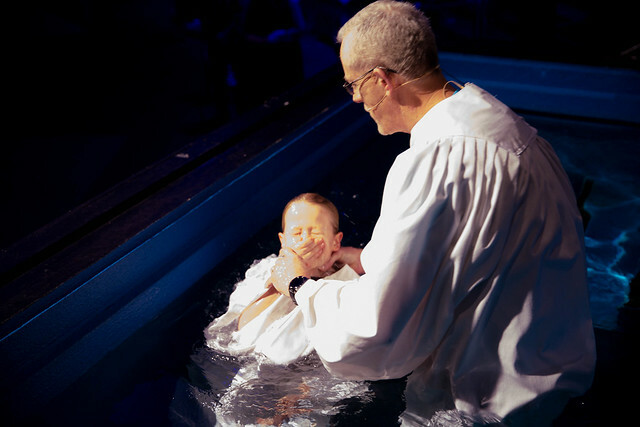 Being baptized shows that we turn away from a life of sin and toward a life with Jesus. Just as a wedding ring is a symbol of a marriage relationship, so is baptism a symbol of a spiritual relationship. If a married person takes off their wedding ring, it doesn't mean that they are no longer married. In the same way, baptism doesn't save a person, but rather signifies to the world the transformation that has already taken place in the heart of a believer. As parents, we can help point our children to Jesus, but they are the ones to decide if they will commit their lives to following Him. For this reason, we wait until children are old enough to express their own decision to follow Jesus and understand the meaning of baptism. The original word for baptism most often referred to being immersed or submerged in water. Jesus was baptized by being immersed in the water and rising out of it. Submersion in the water symbolizes the death, burial and resurrection of Jesus. Being submersed underwater represents our death to sin and old way of life, and being raised out of the water is a picture of how Jesus raised us and gave us a fresh start in life. For everyone who decides to follow Jesus, baptism is the next step. There is no waiting period between accepting Christ into your heart and publicly declaring that decision. Anyone who commits his or her life to following Jesus is ready to be baptized. Sign up for the next baptism celebration.